Recently, a Trader Joe's opened about 25 minutes from us. For you city folk, 25 minutes is a treck. But for us, everything is 25-35 minutes away and it's just become a normal thing for me. The Trader Joe's is in an area where I am at least one day a week, and sometimes every day! It just depends.. but moral of the story, it's CLOSE. First impression: These are really nice looking bell peppers for the a dollar each! At our location, the staff is incredibly jolly and always asks about your day and your life and gives you tips on fun/delicious goodies to try there. They always have a sample out and there's always a drink sample too. This is brilliant for folks like me who can't eat without a drink without feeling like your world is ending. I had heard that TJ's had some great healthy/organic options for a lower price. As you can see, I have three containers of candy on my first trip there. So obviously not everything is like that. But the treats are super fun too. I just realized I'm writing this to a reader that has no idea about Trader Joe's so if you love it and already know this, bear with me. Haha! 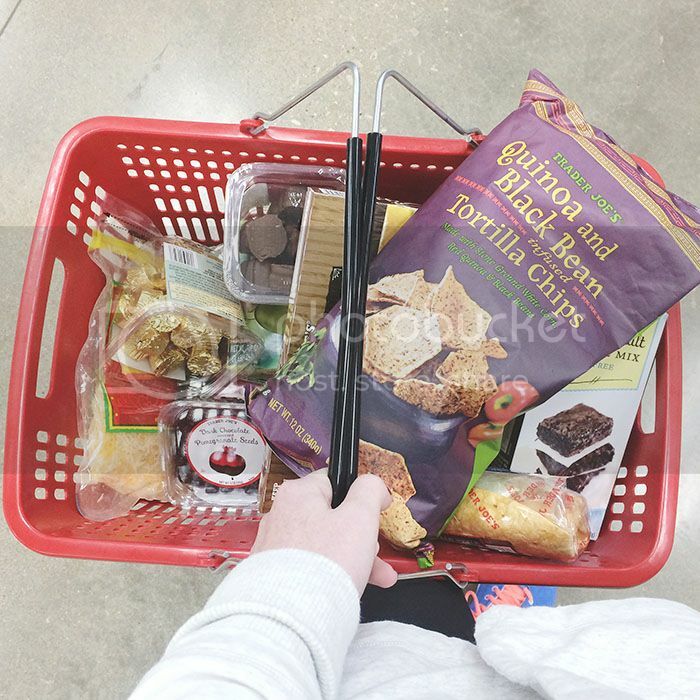 The items we tried in that cart (that are Trader Joe's specific) are the smores chocolates, dark chocolate cookie butter cups, dark chocolate pomegranate seeds, guiltless brownie mix, and black bean and quinoa tortilla chips. Cookie butter cups are life changing. It's been a month and our package is still mostly full but only because I have limited consumption. I didn't like the pomegranate seeds and gifted them to a friend. The chips have like 5 ingredients and have become a pantry staple for us. Guiltless brownie mix is amazing because they really do taste just as yummy as normal full fat brownies! Did I mention that everything is very reasonably priced? I feel like I always go hog wild trying a million goodies and never spend more than like $40. What are your Trader Joe's favorites? ah you're making me wish we had one here! I loooove TJ's and their friendly staff! The "Trader Giotto's" frozen margherita pizza is my fave. It's funny how much your perception of close/far changes based on where you live. I lived in a TINY town for a year after graduating from college, and everything felt like it was a million years away (it was really 30-35 minutes). Now I live in Atlanta and I have this perception that everything's so much closer...but really, half the time I sit in traffic for 30 minutes on my way to that store/restaurant/whatever that's right around the corner! Trader Joe's is almost a way of life here in CA ;) The cookie butter shortbread cookie sandwiches are AMAZING! You can't go wrong with anything cookie butter :) They also have pretty good frozen tamales and salted caramels! I've only ever been to TJ's out of state. The first one I went to was in Massachusetts. Now that they have them local-ish...I haven't been! Ha. The closest one to us is probably the one you are going to...Fort Worth? It's about 30 minutes from us...and we went one Saturday in the fall and there was no parking. Womp Womp. I should drive over there during the week! TJ's double roasted salsa is amazing. Every time we go I pick some up!